Media outlets don’t want America to negotiate with North Korea; they want the US to hold North Korea for ransom. MSNBC‘s Rachel Maddow (6/12/18) appears dismayed by the manifestation of a US president meeting with an Official Enemy. Maddow implied that Trump has taken this step out of fealty to Russia, and complained that pausing war games that threaten North Korea benefits Russia and China. She twice called the Kim/Trump summit a “wedding,” twice said that the two leaders “love” each other, and referred to Kim as Trump’s “best friend.” In other words, de-escalation is for wimps, and what’s needed is toughness, even if it risks nuclear war. Not once did Maddow demonstrate the slightest concern with avoiding war. The message of her segment is that the US should subject all 25 million people in North Korea to the threat of nuclear annihilation until its leaders do what the US says, a threat that necessarily extends to the rest of East Asia, since it would be decimated in any nuclear exchange, to say nothing of the likely devastating effects on the rest of the world. The Washington Post (6/12/18) warned against trusting “a cruel and unpredictable ruler whose motives and aims are far from clear”. The editorial board of the Washington Post (6/12/18) says that diplomacy “is certainly preferable to the slide toward war that appeared to be underway last year,” but opposes taking steps to prevent another Korean War—a nuclear one, this time. 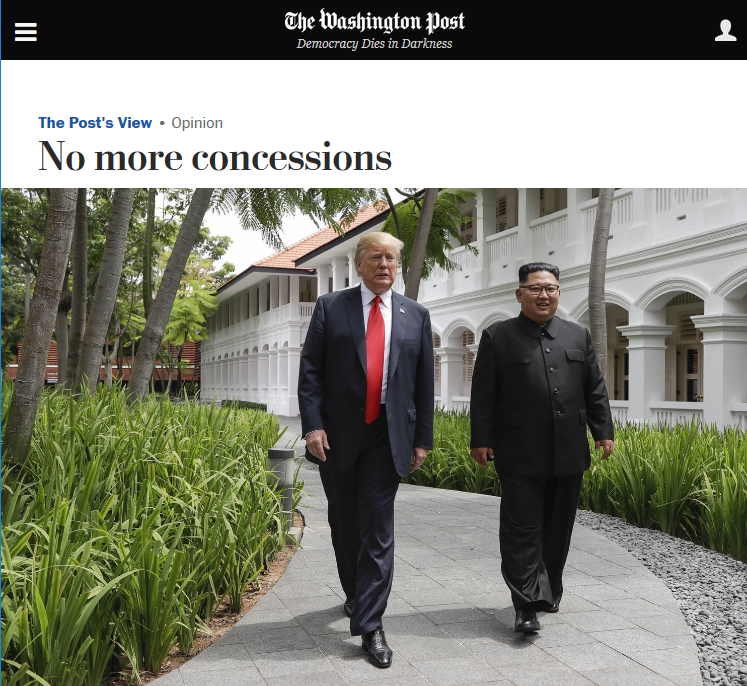 The editorialists complain that the joint statement issued by the leaders of the US and North Korea makes no mention of “US terms for disarmament”: What the editorial, tellingly titled “No More Concessions,” is saying is that the predetermined outcome of diplomacy should be complete North Korea acquiescence to US demands—which, of course, isn’t diplomacy at all. Similarly, the New York Times’ editorial board (6/12/18) writes that “after months of venomous barbs and apocalyptic threats of war, the meeting between President Trump and the North Korean leader, Kim Jong-un, was unquestionably a relief.” Trump, they wrote, “seems seized with the need to resolve it peacefully. That is to the good.” Yet the editorial lists measures that Times believes the Democratic People’s Republic of Korea (DPRK, North Korea’s official name) needs to take, without saying that America should do anything, and expresses anxiety over the break in war games. 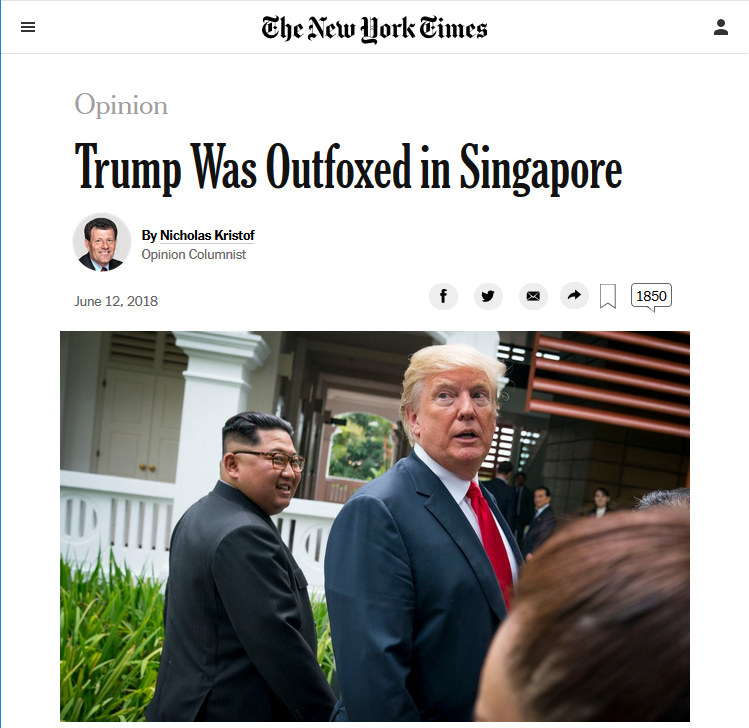 In the same vein, Nicholas Kristof of the New York Times (6/12/18) says that “it certainly is better for the two leaders to be exchanging compliments rather than missiles,” but describes the US suspending military exercises with South Korea as a “concession” for which America is getting “astonishingly little” in return. He purports to be against the exchanging of missiles, but thinks it’s a mistake to take steps to minimize the threat of exchanging missiles. even adopted North Korean positions as his own, saying that the United States military exercises in the region are “provocative.” That’s a standard North Korean propaganda line. The columnist failed to explain how military exercises on North Korea’s doorstep, involving 50,000 South Korean troops and 17,500 of their American counterparts, are anything other than “provocative,” but evidently Kristof would have no problem with joint DPRK/Mexico maneuvers near the US southern border pretending to launch an attack featuring 67,500 soldiers, along with simulated nuclear bomber attacks (FAIR.org, 4/3/13). nothing about North Korea freezing plutonium and uranium programs, nothing about destroying intercontinental ballistic missiles, nothing about allowing inspectors to return to nuclear sites, nothing about North Korea making a full declaration of its nuclear program, nothing about a timetable, nothing about verification, not even any clear pledge to permanently halt testing of nuclear weapons or long-range missiles. 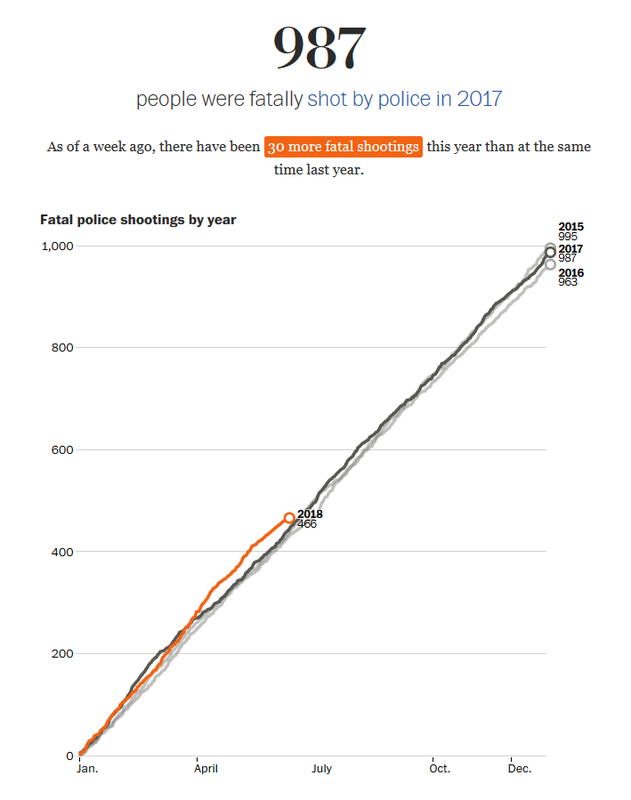 At no point did Kristof call on the US to take any remotely comparable steps. 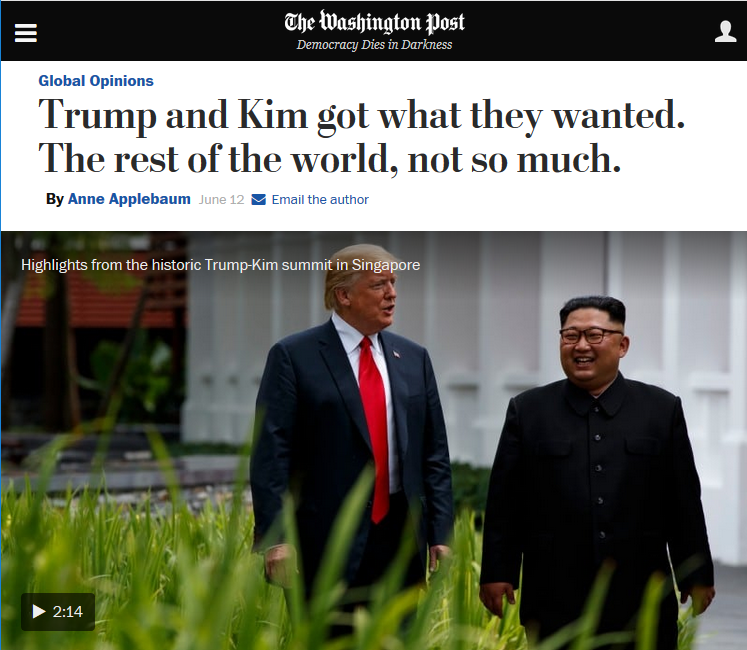 The Washington Post‘s Anne Applebaum (6/12/18) does not seem to see Trump and Kim ceasing to threaten each other’s countries with nuclear destruction as a “gain” for those countries. had any previous American president, Republican or Democrat, emerged from an event like this, in which so much was given away with so little to show for it, he would have been embarrassed. Her article was headlined, “Trump and Kim Got What They Wanted. The Rest of the World, Not So Much.” It’s likely, however, that “the rest of the world” does not want nuclear war, and might want steps that could help avert that danger—such as, say, an end to nuclear-armed America antagonizing another nuclear power by having “tens of thousands of US and [South Korean] troops, aircraft and naval vessels engaged in mock clashes” with that power. Under-girding the view that the United States should only negotiate with North Korea when “negotiation” means “forcing the DPRK under nuclear duress to do whatever America says” are entrenched notions of intrinsic US superiority. States, and the parties that govern them, are not granted legitimacy by the United States. Legally, that legitimacy comes from United Nations recognition or its absence; as a practical matter, states and their leaders establish legitimacy through what the Italian political theorist Antonio Gramsci described as a combination of coercion and consent. Believing that the US has the power to confer or deny legitimacy on other countries or their leaders is part of the same imperial hubris that makes pundits panic about tentative moves in the direction of curtailing American belligerence toward North Korea, and thus the threat of nuclear war. We would find it absurd if pundits complained that Kim failed to extract a promise from Trump to halt the thousand or so extrajudicial executions that take place in the US every year. A comparable dynamic is at work in the commentariat concern-trolling about North Korean human rights. 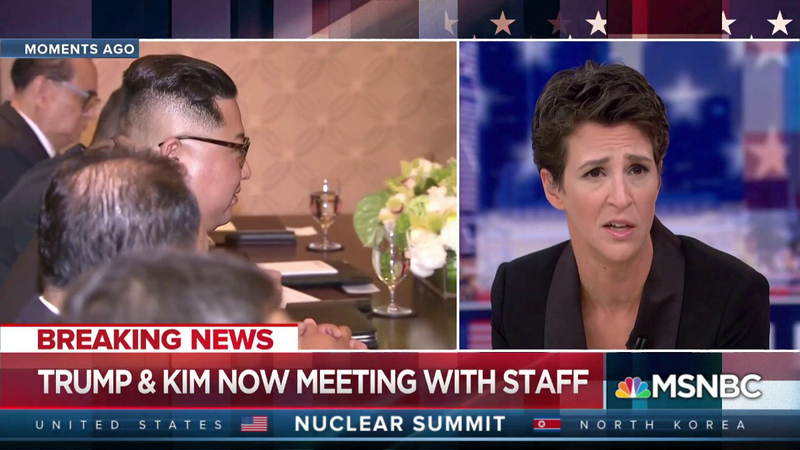 Maddow was perplexed that the US would meet with North Korea without the North Korean leadership making any promises about “their behavior toward their own people.” The Times’ editors considered it “startling” that the joint Kim/Trump statement contains no reference to human rights in DPRK. In this conception, America is the shining city on a hill that must free the people of the DPRK, though these analysts don’t ask who will liberate US citizens living under a regime with the highest incarceration rate in the world, rampant judicial and extrajudicial execution, widespread racism, obscene wealth inequality and an undemocratic political system. Calling for a US government crusade for change inside North Korea while overlooking all of these features of US society is another dimension of the imperial arrogance that insists it’s legitimate to subject the entire population of other nations to crushing sanctions and violent threats until their governments give Washington everything it wants. Nor do any of these commentators address the possibility that the US ruling class might need to change its global conduct: The hanging of Saddam Hussein and the sodomizing to death of Moammar Gadhafi, neither of whom possessed nuclear weapons with which to deter America from invading and destroying the countries they governed, could be a reason why the leaders of North Korea want nuclear weapons. For the punditry, the goal of US/North Korea talks isn’t lasting peace on the Korean peninsula, it’s total North Korean submission to US commands. Corporate media appear to be more worried about the United States being successfully defied than it is about nuclear war.